1 Avril http://cubicle7.co.uk/new-archetype-for-age-of-sigmar-rpg/ New Archetype for Age of Sigmar RPG We want to introduce you to the Branchwych, continue reading for more! Guardians of Life and Death Branchwyches are attuned to the life magic of the forest and are entrusted with most sacred of roles. It is a Branchwyches duty to guard and protect the soulpod glades and to nurture the spirits growing within. They ensure harmony with the Spirit Song — a mystical melody which all Sylvaneth can hear and one that serves as a unifying force among the forest folk. Branchwyches also serve as receivers of the dead, using their greenwood scythes to harvest the souls of fallen Sylvaneth so they may return to the soulpod glades to grow again. I was there at your beginning. I shall be there for your end. This is my promise and my purpose. - Shaniir, Warden of the Greenbriar In Play Branchwyches are spellcasters who can manipulate the arcane energies of the Jade Lore of Magic. This Lore is focused on growth, healing, and the power of nature and as such its energies are strongest in Ghyran, the Realm of Life. Branchwyches are often accompanied by a bittergrub, a caterpillar like Spite that can grow to the size of large snake. Along with the bittergrub, the Branchwych uses its greenwood scythe to cleave down enemies and reap the bodies of fallen Sylvaneth. When the lamentiri of the fallen are returned to the soulpod groves, their memories are added to the ancestral link that all Sylvaneth can tap into. Some Branchwyches can also use their skill and control over the forest to shape deadly weapons for their allies. Players who choose this Archetype gain the ability to cast powerful healing spells and summon the might of the forest to strike down their foes. Branchwyches are versatile spellcasters who are adept in combat, entirely focused on protecting the natural order. Behind the Design The Branchwych was one of the earliest Archetypes we identified as soon as we knew we were going to include playable Sylvaneth characters. One of the things that drew me to the Branchwych was that it embodied the wrath and will of nature, perhaps even more so than the Kurnoth Hunter. 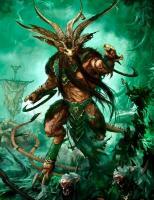 For me, the Kurnoth Hunter is a fierce warrior who represents the destructive power of nature. The Branchwych has the same potential for destruction, but they also represent life and growth — she is there at the beginning and she is there at the end. Like many of the characters and Archetypes in AoSRPG, there is a tragedy and sadness to the Branchwych that is ripe for exploration in a roleplaying game. What Next? Cubicle 7 will be discussing how the factions of the Mortal Realms come into play in the AoSRPG and show off even more new artwork very soon! Keep up to date on Facebook, Twitter and Instagram! Et une petite mise à jour du sujet avec les dernières infos : 25 Mars http://cubicle7.co.uk/age-of-sigmar-doomseeker-reveal/#more-10355 Age of Sigmar – Doomseeker Reveal! Today we’re revealing a new Archetype for the Age of Sigmar Roleplaying Game, the mighty Doomseeker! #MortalRealmsMonday Redemption or Death Oathsworn to leave your home and never return, you travel the Mortal Realms in search of redemption or death. The unbreakable oaths of the Fyreslayers are legendary and the Doomseeker epitomises their stubborn sense of honour. No one knows what could drive a Duardin to swear an oath so mighty as to banish them from their own lodge and nor would any who have sworn such an oath ever say, for a Doomseeker is as reticent as they are proud. Some speculate that they are warriors who have disgraced themselves in battle, that they are the sole survivors of a destroyed lodge, or atoning for some familial guilt. Others whisper that this is the fate of an Auric Runeson who fails to rise to Runefather and refuses to bend the knee to a brother. What is true is that Doomseekers had lives before swearing their oaths. While their skills may be a little rusty, a Doomseeker may still surprise their adventuring companions with an unexpected musical talent, pausing to mend a broken down wagon, or haggling with a street vendor like an experienced merchant. ‘You killed it! Who asked for your bloody help?’ - Lugash, son of no Runefather, scion of no lodge A Doomseeker fears no death, only disgrace, and will never back down from a confrontation without a good reason. Their constant spoiling for a fight will eventually drive long-suffering companions to despair, but most will tolerate it for the sheer brawn and berserker fury they bring to a party. While their companions may never know what drives the Doomseeker in their self-destructive quest, it is this goal that shapes their actions above all else. They could be seeking an ancient treasure that once belonged to Grimnir, a Chaos champion on whom to mete vengeance, or they could simply have banished themselves over a point of principle, an issue of honour that will be erased only in death. In Play Doomseekers are mighty warriors with nothing left to lose. In battle they are terrifying to behold, throwing themselves at their enemies with wild abandon. If you chose to play a Doomseeker you will be a force to be reckoned with in combat. But Doomseekers are more than just barbarians lusting for battle — something in their past set them on this course. This event will fuel a lot of the roleplaying aspect of a Doomseeker and can lead to some dramatic and often tragic moments in play. Behind the Design Looking at the Fyreslayers as a faction, there is no shortage of able bodied warriors. When we were trying to decide who to include in the AoSRPG we looked at what archetype would provide the most roleplaying potential. We initially envisioned using the Vulkite Berzerker, but found that the Doomseeker already came equipped with a juicy storyhook. Having to ask yourself why your character was exiled gives players a really strong starting point when playing a new character. What Next Over the next few weeks we will reveal more Archetypes for the Age of Sigmar RPG. We’ll also look at how the factions of the Mortal Realms come into play and show off even more new artwork. Be sure to sign up to our newsletter so you don’t miss out! You can also join us over on Facebook, Twitter and Instagram. Filed under: NewsComments Off 25MAR/19 Off Age of Sigmar Update! Have you met the six bold adventurers defending the Mortal Realms in the name of Sigmar? The Knight-Questor Warpriest Grphy-Hound Endrinrigger Kurnoth Hunter Tidecaster Age of Sigmar RPG is due in 2019. Check back for regular updates! In case you missed our last major update find it here. J'ai arrêté de jouer et de suivre l'actualité de Warhammer 40K depuis 10 ans. La dernière édition à laquelle j'ai joué, c'était la 4ème. Il est probable que je maîtrise dans les prochains mois Wrath & Glory. Donc le jeu de rôle qui se passe dans l'univers de 40K. Est-ce qu'il y a des livres, sites ou autres que vous pourriez me conseiller afin de me mettre à jour et d'avoir une vue sur les différents événements qui se sont passé dans l'univers de 40K? Car il y a l'air d'avoir eu pas mal de changements. J'aurais tendance aussi à ne prendre qu'une seule Médusa mais deux hag queens. Je serais ravi du retour des Skavens. Et j'aime bien aussi les Flesh Eaters. Même si je n'ai aucune de ces 2 armées, je pourrais quand même craquer. Et si cela pouvait annoncer une refonte des skavens, cela serait parfait. Je ne mettrai pas non plus Morathi pour ce format. Un Chaudron avec une Slaughter Queen et des Hag Queen à pied pour accompagner les Witch Aelves, c'est quasiment la base indispensable pour une armée de DoK. Et les Heartrenders sont très bien pour le harcèlement. Pour le reste, je pense que c'est l'occasion de tester avec les points restants d'autres figurines afin de voir ce qui fonctionne le mieux. Mais c'est vrai que l'Hydre peut-être très sympa. Une figurine qui a chargé ne peut plus être activée par la suite? Même juste pour attaquer? Merci de vos réponses. Et on s'est bien amusé. Fatalement, on a pris les decks préconstruits de la boîte de base pour s'essayer. Donc on ne connaissait pas tous les effets et les cartes qu'on avait mais on a apprécié l'expérience. Autre petite question : on est d'accord qu'une figurine peut être activée plusieurs fois dans un même round? Elle ne pourra faire qu'un déplacement mais elle pourrait attaquer à de multiples reprises. Je vais bientôt faire ma 1ère partie de Warhammer Underworlds avec un ami. Cela sera une partie découverte et cela sera avec la V1 car c'est celle que j'avais (et pas eu l'opportunité de jouer plus tôt). Petite question : Il faut dépenser un point de Gloire pour CHAQUE Amélioration que l'on veut jouer? Ou juste pour la 1ère amélioration? Si j'ai bien compris, si un point de gloire par amélioration mais j'aimerais bien une confirmation. Nouveau joueur AoS, quelle armée ? Les Daughters of Khaine sont moins fragiles qu'elles en ont l'air. En sélectionnant le bon temple, les Chaudrons de Sang et les prières, elles commencent à bien résister. Et elles envoient du lourd au corps à corps. Mais effectivement, c'est à Octopus de voir ce qu'il souhaite. Effectivement, à voir si c'est simplement une simplification de la présentation ou si cela signifie un véritable regroupement de certaines sous-factions ensemble. En même temps, cela fait du sens de les ressembler. J'ai une question sur les cartes d'améliorations comme celle-ci dessous. En gros, celles qui donnent un profil d'attaque. Si je comprends bien : ou je joue l'attaque sur le profil de la carte du personnage ou je joue l'attaque fourni par la carte de l'amélioration. C'est bien ça? ﻿ Vanguard raptors avec arbalète hurricane﻿ est un autre choix efficace en terme de tirs. Surtout si on affronte une armée populeuse. @recqq Merci pour le lien. J'aime beaucoup les figurines des Melusai et du coup, je suis bien tenté de compléter mon armée de DoK avec des Melusai pour pouvoir alterner le type de liste. Au final, c'est une de choses qui m'a attiré dans l'armée. C'est la possibilité de faire des choses différentes. Je serais tenté aussi par une armée type Shadow Patrols. Afin de ne pas tout le temps joué la masse de witch. En effet, nos tirs sont assez anecdotiques et il n'y pas de Behemot/Monstres (à part l'Avatar). J'avais déjà pensé à la War Hydra. Et pour le tir, j'hésitais entre les Stormcasts ou les Darkshards. À nouveau, l'idée est de pouvoir varier les listes d'armées. Sachant que je ne joue qu'en amical à l'heure actuelle. Par contre, sous l'alliance Ordre, je pense que les DoK perdent pas mal de leurs avantages. Et là, il n'y a pas de grand intérêt à jouer sous cette alliance si la majorité des figurines sont DoK.